For me as a parent, sleep is probably right up there with my top priorities - that don't revolve around my children. I'm half certain, if there were dealers in sleep, I'd be hooked. I don't really think it matters if your children sleep through the night or not as to whether you can't wait to get your head down at the end of the day, because they've undoubtedly run you ragged through the day anyway. My boys are good sleepers and always have been but that doesn't make my bed any less appealing at the end of the day. In fact, my bed is appealing at most points throughout the day and so of course when Brighter Mattress offered me to review one of their cooling memory foam mattresses, how could I refuse? I didn't think our mattress was all that bad, it did the job and that was all that mattered to me. How wrong was I. Not until I finally settled down on my brand new one, did I realise just how awful our old one was. 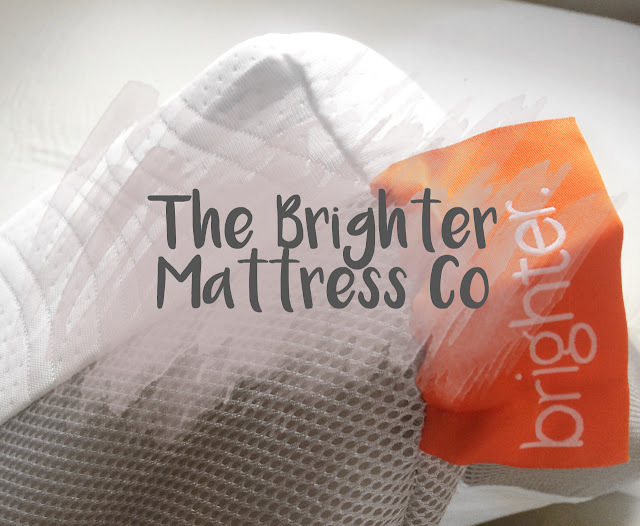 The Brighter Mattress Co pride their mattresses on having active airflow technology, which means on those hot and sticky nights you're not going to be sleeping in a hot bed, as the mattress replaces hot air with cool, keeping you fresh and able to get a good nights sleep. I really couldn't say enough about this mattress, every evening I completely forget we've upgraded and then when I climb into bed I let out a little 'Ahhh' when I'm reminded by the soft, comfortable way it hugs around me as I lay down. The Brighter Mattress Co currently have a £50 off code by entering '50OFFSPOOKY' at the checkout, which is live, so do make sure you enter that if you're thinking about buying. If you're not 100% sure, they have a fantastic 100 day trial, so if for any reason you aren't happy with your purchase (I assure you, you absolutely will be) then they'll refund you with no quibbles. What more can you ask for? I've got mine in it's box still as we're moving on the 15th, eeeep can't wait to give it a go!